Castle Island is a great place to spend an afternoon. It's located at City Point in South Boston, and can be reached via public transportation. It's a nearby destination to escape the bustle of the city, and to obtain great views of Boston Harbor and Logan Airport. Sullivan's take-out only restaurant (seasonal) is housed at the base of the old fort, and is very popular with the local residents. Public restrooms are also available on the island. Please note it can be very windy at Castle Island, so dress appropriately for prevailing weather conditions. From the parking lot, walk to the left of Fort Independence. As you reach the ocean, there is a fishing pier that can be very crowded during summer, and when certain fish species are being chased into the harbor. The large granite obelisk near the pier is a memorial to Donald McKay, a famous Bostonian that built large sailing vessels known as clipperships in East Boston during the 1850s and 1860s. Continue walking around the castle, and you'll reach the playground and picnic areas, as well as the main entrance to the fort (summer tours only). 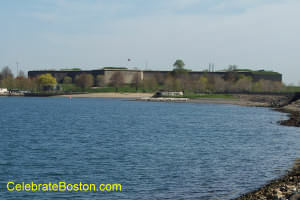 There is a crescent-shaped path that stretches out into Boston Harbor and creates an artificial pond known as Pleasure Bay. Many joggers and pedestrians enjoy walking the entire length of the byway, all the way around back to Day Boulevard and the parking lot (about 1 mile). An interesting part of the walk is crossing over two narrow bridges over Pleasure Bay; when the tides change, you can stand on these small bridges and watch a swift current pass underneath, caused by the compression of the water. There are many seagulls to observe at the small circular park, known as the "Sugar Bowl," located at the farthest point of the path out in the harbor. The MBTA public transportation network has multiple bus lines to City Point. Bus Line #9 departs from Copley Station (Green Line), to Broadway Station (Red Line), then onto City Point. At Farragut Road, the end of the bus line, you have to walk a moderate 3/4 of a mile to get to the castle. If you can brave Boston traffic, from South Boston just drive east on Broadway until you reach the ocean, and then take a left on the road to the island (ask your hotel for specific driving directions). There is a parking lot at the base of the castle. "In 1634, Governor Dudley of Massachusetts Bay Colony, selected Castle Island for the sea defense of Boston. The first fortifications were an earthwork and two platforms, with three cannons. A pine log fort (1644), the second fort, was replaced with a more substantial structure in 1653. This burned down and was quickly replaced with the fourth fort (1673). In 1703, Colonel Romer's brick, four-bastioned fort, begun in 1701, was dedicated, and for most of the 1700's thereafter, was generally known as 'Castle William,' after William III of Orange, King of England. It was armed with 72 cannons, ranging from 9 to 42 pounders. In 1775 the British, evacuating Boston, destroyed the island's fortifications, which were repaired shortly thereafter by troops under Lt. Colonel Paul Revere. President John Adams, came to dedicate a new fort as 'Fort Independence' in 1799. This, the island's seventh fort, five-bastioned and of brick, was built by Colonel John Foncin between 1801 and 1803. By 1851, Colonel Sylvanus Thayer, the 'Father of West Point,' completely reconstructed the eight and present fort on Castle Island; doubling the former height, expanding its perimeter, constructing casemate interiors, and replacing brick with granite from the quarries at Rockport, Massachusetts. When the Stamp Act was passed in 1765, packages of offending stamps were landed and stored at Castle William. As a result of the Boston Massacre , the 14th and 29th British regiments were withdrawn from Boston to the safety of Castle William. At the time of the Boston Tea Party , many loyalists, including consignees of the tea, sought refuge in Castle William. The duel between Lts. Massie and Drane in 1817, has resulted in a legend that still lives. Edgar Allan Poe served on Castle Island in 1827, under the name of Perry, and his story of 'The Cask of Amontillado' is alleged to have been influenced by the Drane-Massie duel."